In anticipation of the November 2016 presidential election, the Russell Library’s Access and Outreach staff has been working on curating an exhibit, On the Stump: What Does it Take to Get Elected in Georgia? opening September 2nd in the Russell Library’s Harrison Feature Gallery. The exhibit On the Stump considers the evolution of campaigning for state office and asks visitors to imagine life on the campaign trail. This post is one in a series exploring political slang and its role in elections. In electoral politics, constituents have a tendency to vote according to party. In the nineteenth century, voters simply choose a party ballot that encouraged “riding on the coattails.” Though modern voting machines decreased “straight-ticket voting,” the trend still exists. Popular presidential candidates , for instance, often attract votes to Congressional candidates of the same party. Dubbed the coattail effect, political analysts continue to debate its significance in shaping electoral outcomes. 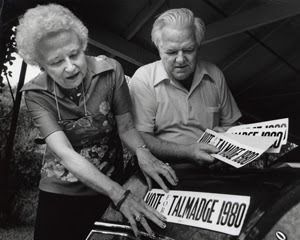 Right: Marion Baker and Timmy O'Keefe campaigning for Herman Talmadge, Savannah, GA, 1980. Herman E. Talmadge Collection, Russell Library. Left: Mack Mattingly meeting with constituents on the campaign trail, 1980. Mack F. Mattingly Papers, Russell Library. Few states that year produced more significant results than Georgia. Despite native son Jimmy Carter securing 56 percent of the popular vote in the presidential election, four-term incumbent Democratic Senator Herman Talmadge lost a close 51-to-49 race to state Republican Party chairman Mack Mattingly. Mattingly’s victory, by about 27,500 votes and a 1.7 percent margin, was the first for a Republican Senate candidate in Georgia since Reconstruction and the first since the 17th Amendment created popular elections for the U.S. Senate. Above: Talmadge Campaign Leaflet, 1980 re-election campaign. Herman E. Talmadge Collection, Russell Library. A number of factors led to Talmadge's defeat—among them his known battle with alcoholism, and allegations of financial misconduct which landed him before the Senate Ethics Committee in 1979. In the Democratic primary, Zell Miller offered a strong challenge to the weakened Talmadge campaign, which never recovered for the November general election. In a year dominated by Republican victories, it is difficult to say what might have happened had Talmadge not faced scandal and personal difficulties during the campaign. Republican Mack Mattingly served in the U.S. Senate only one term, losing to Democrat Wyche Fowler in 1986. To find out more about the ins and outs of the 1980 Senatorial campaign between Talmadge and Mattingly, take a look through their finding aids online. Scrapbooks (available on microfilm) from the Mattingly collection, compiled by the senator's staff and family, record the highlights of the senator's political career and campaigns. 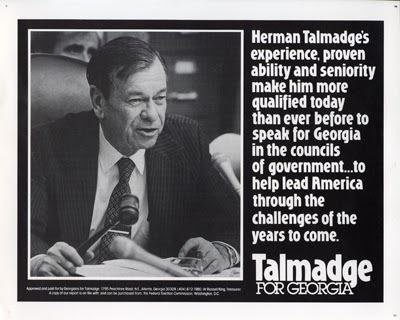 The Talmadge Political Series documents all his political campaigns from 1956-1980. More recently, President Obama’s solid victory in 2008 accompanied impressive Democratic wins for Democrats in Congress, gaining eight seats in the Senate (for a 59-41 majority, the widest for either party since the 1970s) and 21 in the House (for a 257-178 majority, the widest since 1992). However, congressional results in 2008 may have simply represented a welcoming year for the Democratic Party, both “up” and “down” the ballot, rather than evidencing far-flung Obama coattails. What will the presidential election of 2016 hold? Stay tuned…..
Want to find out more? Visit On the Stump on display in the Harrison Feature Gallery in the Richard B. Russell Building Special Collections Libraries from September 2August 22, 2016 through July 31August 18, 2017. The Russell Library gallery is free and open to the public weekdays from 8 a.m.-5 p.m. and on Saturdays from 1-5 p.m. For more information, email russlib@uga.edu or call 706-542-5788.